Given my last blog article regarding an ENT who got sued for not doing an MRI after audiogram showing an asymmetric hearing loss, the question that should be on everybody's mind is what IS asymmetric nerve hearing loss on a hearing test? I am sad to report that there is no clear consensus on what is asymmetric nerve hearing loss. First of all, at its most basic definition, asymmetric nerve hearing loss is when hearing is worse in one ear when compared with the opposite ear due to nerve damage. 1) A tumor can be pressing against the nerve causing it to slowly fail faster than the other ear's nerve which is not compressed. 2) There is a loud noise history with asymmetric exposure to the ears. One example is hunting with a rifle where the left ear would repetitively get noise-induced damage from the gunshot in a right-handed shooter. The conflict is at what point is an asymmetry considered significant enough to warrant a workup which may include an MRI scan of the head and/or auditory brainstem response (ABR)? Also, for a given patient history, a physician/patient may elect to recheck hearing bi-annually to monitor for asymmetric progression rather than pursue workup immediately (further studies being pursued only if asymmetry progresses over time). 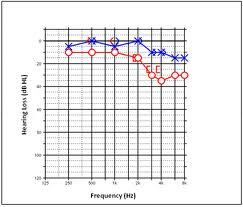 Is asymmetry defined as 1 decibel difference between ears? Is it 50 decibel difference? Even if the decibel difference is agreed upon, than over what frequencies? All of them or just a few of the frequencies? So for the purposes of a "medically" significant asymmetric nerve hearing loss, the definition must define not only HOW big the difference in hearing loss is present between ears but also at what frequencies. In one paper and another, it is 15 decibels at just 3000 Hz. In another paper, it is 20 decibels at any two adjoining frequencies (or 15 decibels at two adjoining frequencies between 2000 and 8000 Hz). Get this... even when criteria is defined, one study found substantial disagreement among five expert judges on what hearing tests they considered showed asymmetry. Even insurance companies are jumping into the fray in what they considered significant enough to warrant covering the MRI scan. At one point when I ordered an MRI scan of the head for what I thought was a significant asymmetry found in one patient's hearing test, the insurance company denied the test citing "that there needed to be other neurological deficits PLUS the asymmetry seen on hearing test before MRI scan would be authorized". I personally pursue further workup using the 20 decibel difference at two adjoining frequencies OR 30 decibel at one frequency. What are the chances of something bad going on (i.e., tumor) when an MRI scan of the head is ordered for asymmetry found on hearing test? Less than 10% (depending on study, can be as low as 1-4%). Given such a low positive yield on testing, why even pursue a MRI scan? Because of defensive medicine to avoid being named in a lawsuit if the affected patient just happens to be within that 10% found to have an acoustic neuroma. Indeed, in one study, 40% of ENTs stated medico-legal concerns factored into their decision to get an MRI scan of the head. I currently have this exact condition. My MRI was negative for a tumor but the condition is worsening. My right ear is basically gone and the condition is impacting my left ear hearing more profoundly. At what point is it considered a disabled situation? I'm going through this currently. I got my hearing checked and the doctor told me that I basically cannot hear consonant sounds in my right ear. My MRI is Monday to see if a tumor is to blame but I'm terrified that if the MRI comes back negative my hearing will just get worse and worse until I can't hear anything.